This interview was originally published by SFScope.com on November 26, 2008. James Patrick Kelly is an award-winning science fiction writer. Although he’s best known for his short stories, Kelly has also written novels, novellas, poems, plays, essays, and reviews. His novella “Burn” won the 2007 Nebula Award from the Science Fiction and Fantasy Writers of America and he’s won the Hugo Award twice: once for his novelette “Think Like a Dinosaur” and again for another novelette titled “Ten to the Sixteenth to One.” Kelly is also well known for his podcasts and his regular internet column for Asimov’s Science Fiction magazine. In addition to his writing work, Kelly is on the faculty of the Stonecoast Creative Writing MFA Program, the Vice Chair of the Clarion Foundation, and is a councilor on the New Hampshire State Council on the Arts. SFScope: The Wreck of the Godspeed is a collection of stories you’ve written over the last five years. When you were putting this collection together, what inspired you to choose this group of stories? Kelly: Well, I could give a, how shall we say, artistic, deep answer, but the fact of the matter is that these are the stories that I wrote in the last five years. So, basically this is everything that I think is good that I have written in the last five years. I have left a few things out, but not too much. Having said that, I really feel like this group of stories is among my strongest as a whole. Now, of course, this is my third short story collection from Golden Gryphon, and I have some stories in my other two collections that I love dearly. Many people who know my work, at all, know me for my story “Think Like a Dinosaur”, which was the title story of my first collection. I am very proud of these stories. There are, as I’m looking at the table of contents, I think, seven stories that were in “best of the year” collections in various and sundry forms: best fantasy of the year, best science fiction of the year, best short novel of the year, and several award nominees, some Nebula nominees, couple of Hugo nominees, and after a long, long drought, my Nebula award winning novella “Burn”. So, I picked these stories because they were the stories that I wrote in the last five years, but I also think that they’re some of the best work I’ve done. SFScope: Most of the pieces in this collection, as with your main body of work, are short stories. What is it about the short story that draws you to this medium with such passion? Kelly: One thing is that it’s a very nimble art form. So, if people are talking about some issue, it isn’t that big a commitment of time to sit down and say, “Okay, I would like to write about some issue that people are talking about or this discovery that is really very intriguing, or to weigh in on some of the artistic controversies of the day.” I can do that in a way that a novelist can’t. A novelist really has to make a big commitment to say, “Okay. So, I’m not really going to write any short stories for the next year.” For some of them, in some cases, it may be more than a year. Some of them are faster than that, but it would be a real hardship for me to not be writing short stories. Having said that, “The Wreck of the Godspeed”, “Burn”, and “Men are Trouble” are three longish novellas. So, although I haven’t actually written a novel in a while, I think that these particular three stories have the heft of intellectual conceptualization that many readers go to a novel for. SFScope: When you were writing the longer pieces, at what point did you realize, “Hey, this isn’t a short story anymore. This is a novella. This is something different.” How did it affect your writing process, once you realized it wasn’t a short piece? Kelly: Well, “Burn” is a special case, because my contract for that was designed from the get-go, from the beginning, to be a chapbook. It was to be a novella from the moment that I agreed to write it, but what happened was that it was supposed to be between 25,000 and 30,000 words. At the time, I hadn’t really written anything quite that long in a long time, not since I had written my last novel. So, when I agreed to do that project, I basically said, “Well, you know, I guess I could write 30,000 words, but if I can’t, I can have big margins and sort of fake it. So, if I get up to 25,000 words, no one is going to turn me down for that. As I started writing “Burn”, it really took on, as I said before, the heft of a novel. Ultimately, it turned out to be 40,000 words, and because I had postponed writing it until the deadline loomed, I really was out of time. I probably could have written more about “Burn” and about the world of “Burn”. Many readers have asked me, “What else happened? There is this whole universe that exists in ‘Burn’ with the thousand worlds, what else is happing there?” I knew from the get-go that I wanted to do that. On one hand, “The Wreck of the Godspeed” was supposed to be a novelette, but it was supposed to be a 15,000-word novelette. Once again, I just really fell into that world, and it got bigger and bigger and it wouldn’t fit into the amount of space that I had been contracted for. So, I went and wrote what needed to be written. On the other hand, when I come across a short story like “The Ice is Singing”, for instance, that was a matter of a whim. It’s the story about an ice skater at Christmas who finds a body and throws it into the ice. I was ice skating at Christmas one time and the ice was a little shaky and I was a little trepidatious. I came back, and the feeling was so strong that I went and batted that out in a matter of four or five days. I get asked a lot about why I write short stories? What I like about the form? I think that it’s because the form can give me the satisfaction of writing a short novel. At the same time, it can give me the satisfaction of basically conceiving and producing a story overnight, or very quickly, so that the initial feeling I began the story with is still very strong when I get to the end. When you write a longer piece, like a novella or a novel, obviously you have to find a ways to sustain your interest and to sustain your excitement. Many novelists, myself not the least of them, get kind of bogged down in the middle of a long project, saying, “Oh, my gosh. Is this ever going to end? I’m so tired of it. I’m so tired of these characters. I’m tired of this world.” I like the fact that even within the boundaries of what is considered short fiction—from short stories to novellas—I can have a variety of writing experiences. SFScope: One of the problems with short stories, and maybe it’s not that big of a problem nowadays, is that their life expectancy is pretty short. When putting this collection together, which of these stories were you most excited about reviving? Kelly: Oh, interesting! You know, when you say that, I will agree in general, but my specific experience has been—you know, there’s just no humble way to say this—my stories get reprinted a lot. So, the thing that was most exciting to me about collection was reprinting “The Wreck of the Godspeed”, because I had written this story for Robert Silverberg, he asked me to contribute to a collection called Between Worlds and it was well published as a hardcover, but hardly anyone saw this story. It was longish. It wasn’t a good candidate to get reprinted in any of the year’s bests, and it did not. This is its first reprinting, and I really think that this is some pharmaceutical quality James Patrick Kelly fiction. That’s the story that I’m most excited to have showcased here. Originally, my editor wanted to call the collection Men are Trouble. He really loved that story, and not to put too fine a point on it, so do I. But when Bob Eggleton, whom we contracted to do the cover—he’s done the covers for all of my Golden Gryphon short story collections—read the collection, he was taken by “The Wreck of the Godspeed”. He produced what I think is just a gorgeous cover. So, we just decided that this collection should be called The Wreck of the Godspeed. 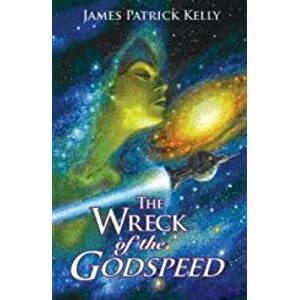 Really, “The Wreck of the Godspeed” has more of a science fictional flavor to it as the title of a short story collection. “Men are Trouble”, for those who may not know it, is a detective story set on Earth in a world where all of the men have been disappeared. It has the flavor, that’s exactly what I wanted, of Raymond Chandler and Dashiell Hammett hard-boiled noir detective. So, to have this short story collection named after a story called “Men are Trouble”, which would have been fine, would have pointed some readers in the wrong direction. There’s one really, really good detective story in there, but the rest of this is science fiction. What’s interesting about this is that some of the science fiction is as science-y or as space opera-y as I have ever written. “The Wreck of the Godspeed” and “Dividing the Sustain” are stories that take place way the heck out there on a starship, and that had never been my forte. I’m very pleased with the way those stories turned out; it’s a new direction for me. SFScope: In addition to publishing in print, you’re also very well-known for your podcasts. How has working in both media, fiction and audio, affected your fiction writing? Kelly: The sad fact of the matter is that while I was busy doing an enormous project for Audible.com—they contracted with me to read 52 of my stories, which is about the equivalent of four short story collections—it was very difficult to get new stories written during that project. So, in the short term, I think it was somewhat of a detriment to my output as a fiction writer. On the other hand, it was a very interesting process, because when I put a short story collection out like The Wreck of the Godspeed, I look at my bibliography and say, “There’s a story, there’s a story, here are the stories that I have written in the last five years.” They’re all stories. Then I read them, mostly for proofing. So, to have gone back over my entire career pretty much, 52 stories, and to have that intimate connection with stories that I haven’t really thought deeply about in twenty-some-odd years was very helpful in sort of gauging where I am and where I’ve come from, where I am now and what I still need to do. A writer who has been at it as long as I have has to worry about repeating himself, stealing from himself, or covering the same ground too many times. Reading all of those stories for Audible.com helped me to realize that there are, sort of, obsessive issues that appear again and again and again in the work, but also that I don’t need to write some stories that I easily could write but I’ve done that material already, maybe to death in some people’s opinions, but nonetheless I’ve done that stuff. So, it was a year of thinking about my career and thinking about myself as a writer and going back to the work, which I’m hoping will be helpful going forward. SFScope: What do you think you have coming out in the future? What kind of projects are you planning? Are there any more novellas out there, or even a novel waiting to be written? Kelly: Most immediate on my plate is a sequel that I have already begun to “Men are Trouble“. Because I am very much an aficionado of Raymond Chandler, it took me a long time in my career to actually write a story that was an homage to him. I reread the entire Chandler oeuvre every five or six years. As a matter of fact, I’ve read his letters, I’ve read his notes, and I’d read his checks, if I could get my hands on them. SFScope: You sound like a stalker, Jim. Kelly: Yeah, I know! But he’s dead, so he doesn’t mind. I’m sure that wherever he is in the Cosmos, he’s happy that he has a fan as devoted as I. So, I was really happy with the reception that “Men are Trouble” got. I have another story that involves the main character Fay Hardaway, which I’m in the middle of writing at the moment. I also have in my head maybe some more to do about “Burn” and the world of “Burn”, the thousand worlds, and maybe Chairman Winter. I’m not really sure. The other thing I should say is one of the stories in this collection, a short story called “Mother”, is actually a chapter from a novel that I have had underway for lo these many years, maybe fifteen years now, which I go back to from time to time. It’s sort of a… I guess you would say it’s a comic, cyberpunk, alien first encounter novel set in New Hampshire. If you want a taste of that book, which I have twenty thousand words of (I don’t know why I’m stopped on it because I know what happens next. It’s a thing that, when I looked at my own process, it’s a puzzlement to me. Nonetheless, I intend to someday finish that novel), “Mother” is a piece of it. SFScope: You’ve also been doing some work as an editor? Kelly: Yes, in one of my other careers, I have crossed that line from being a writer to being an editor. I’ve had a bunch of projects with my pal John Kessel where we tried to define some genres in these collections. One of them is called Feeling Very Strange, the slipstream anthology, and the other one is called Rewired, the post cyberpunk anthology. It’s interesting to look at a collection of stories or a possible crop of stories that you want to select, and you decide how you want to shape a book when it isn’t your own work. One of the “inside baseball” things about doing a collection is how you actually decide what comes first, what comes last, and what goes in the middle, and what’s the rhythm of the book. Doing these other collections with John, it was somewhat easier since we stuck to chronological order, not always, but sometimes. In The Wreck of the Godspeed it was more like, “Okay, I want a long one. I want a short one. I want a fantasy. I want a space opera. I want something that’s sort of gritty. I want something that’s light and funny.” So, that process of deciding how to put a table of contents together… my work as an editor has helped me in that very small, but not unimportant, part of putting a short story collection of my own together. That is, how does the reader experience it? Of course, after I’ve done all of this over-thinking, what will happen when someone buys this book is that they’ll look at the titles, and say, “Oh, I want to read this one first.” Or say, “No, that one looks stupid. I want to read this one next.” Or, “Oh, I heard that this one is really good.” Or, “Oh, I already read that one so I don’t need to read it again.” So, all of this careful planning has gone for naught. Nonetheless, thoughtful short story editors try to accommodate some kind of rhythm for the reader, assuming the reader is going to read the collection front to back. SFScope: When someone does read the collection front to back and they still want more James Patrick Kelly, where can they go? Kelly: Well, there are a couple places. Of course, there are two other short story collections from Golden Gryphon: Strange, but not a Stranger and Think Like a Dinosaur. You can also go to my website, www.jimkelly.net, which is rather extensive, and I have posted many of these stories, if you can stand to read them off of a screen, as PDF files on my website. Then there is an expansive podcast collection as well, all of it for free. There are 52 stories on Audible.com. There are a couple of novels, including Burn that you can read on my website. For free on my podcast website, called Free Reads, there are many stories and more to come. SFScope: Thank you so much Jim. I really appreciate your taking the time to do this interview for SFScope.com. Kelly: You’re welcome. It was my pleasure. 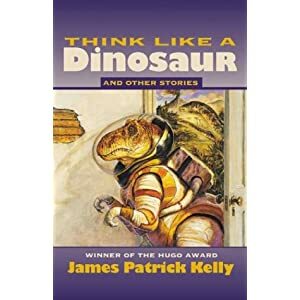 This entry was posted in Books and Literature, Interviews, Science Fiction and tagged Asimov's Science Fiction, Hugo Award, interview, James Patrick Kelly, Literature, Online Writing, Science fiction, Science Fiction and Fantasy Writers of America, Short story, Think Like a Dinosaur. Bookmark the permalink.